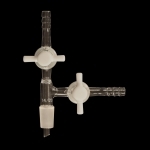 Borosilicate glass flushing adapter with Inner Joint and two stopcocks. For introduction/flushing of gases. With glass or PTFE stopcock plugs. 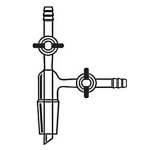 For replacement of stopcock plugs and accessories, see AC-0010, AC-0012 and AC-0016. Lower inner joint size 14/20. Glass stopcock. Lower inner joint size 24/40. Glass stopcock. Lower inner joint size 14/20. PTFE stopcock. Lower inner joint size 24/40. 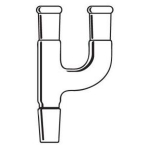 PTFE stopcock.